Dwight Gooden (NY Mets) autographed 1984 Topps Update Rookie card. All autographs are 100% guaranteed and come with a certificate of authenticity from www.RKSportsPromotions.com. 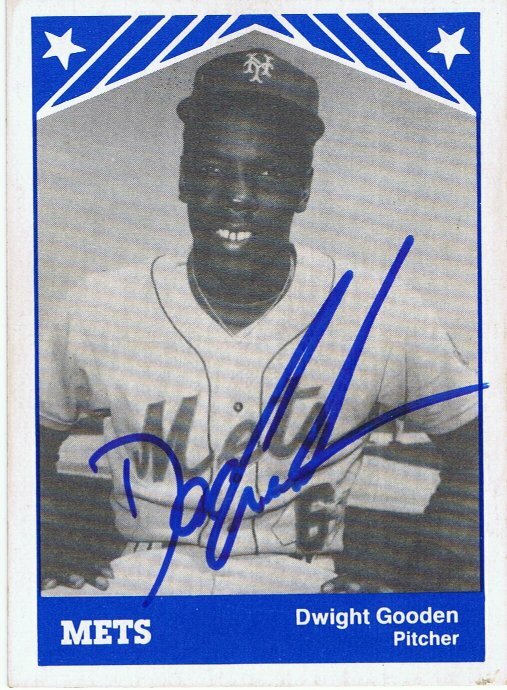 Dwight Gooden (NY Mets) autographed 1985 Donruss Rookie card. All autographs are 100% guaranteed and come with a certificate of authenticity from www.RKSportsPromotions.com. Dwight Gooden (NY Mets) autographed 1985 Topps Rookie card. All autographs are 100% guaranteed and come with a certificate of authenticity from www.RKSportsPromotions.com. Dwight Gooden (NY Mets) autographed 2013 Topps Archives card. All autographs are 100% guaranteed and come with a certificate of authenticity from www.RKSportsPromotions.com. Dwight Gooden (NY Mets) autographed 1988 Drakes card. All autographs are 100% guaranteed and come with a certificate of authenticity from www.RKSportsPromotions.com. Dwight Gooden (NY Mets) autographed 2001 Topps insert card. All autographs are 100% guaranteed and come with a certificate of authenticity from www.RKSportsPromotions.com. Dwight Gooden (NY Mets) autographed 1986 Beatrice Meadow Gold card. All autographs are 100% guaranteed and come with a certificate of authenticity from www.RKSportsPromotions.com. Ed Kranepool (NY Mets) autographed 1979 Topps card. All autographs are 100% guaranteed and come with a certificate of authenticity from www.RKSportsPromotions.com. Ed Kranepool (NY Mets) autographed 1977 Topps card. All autographs are 100% guaranteed and come with a certificate of authenticity from www.RKSportsPromotions.com. Ed Kranepool (NY Mets) autographed 1974 Topps card. All autographs are 100% guaranteed and come with a certificate of authenticity from www.RKSportsPromotions.com.